Nelson's collection is divided into three distinct sections, but almost all of the poems included have a sense of vulnerability and melancholy. There is a focus on loss - lost love, lost mobility, lost time - the wreckage of broken relationships, hearts, and bodies. The first section, field journals written about the canal, captures this essence and distills it. She uses minutia to highlight entropy. The tension between beauty and decay, treasure and refuse. A time capsule of a single summer that simultaneously has a timelessness that extends to every summer. The stretch of endless afternoons, summer heat, and isolation. 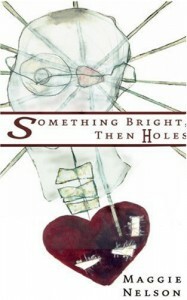 Written mostly in couplets this collection is sparse, raw, observant, and pensive.